Often time’s people ask us if they can apply roof coatings onto the outside walls of their building. They are drawn to the roof coatings’ benefits and are hoping to be able to apply them to their buildings’ exterior walls. We have a better option though, the RenuWall Weatherproofing System. This system consists of the use of elastomeric wall coatings, which are very similar to our AcryShield elastomeric roof coatings; however, the RenuWall System is specifically designed for application over existing walls. The elastomeric wall coatings provide superior weatherproofing, long-term durability, excellent resistance to dirt pick-up, prolonged wall life, and reduced life cycle costs. The RenuWall System is designed to move with the expansion and contraction of the building to ensure hairline cracks remain watertight. As shrinkage occurs in new stucco, the elastomeric wall coatings fills in any cracks and voids to provide a completely sealed and attractive exterior surface. Theses systems are made of high performance acrylic coatings that provide outstanding resistance to weathering, temperature fluctuations, ultraviolet radiation and mildew. 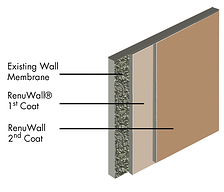 The RenuWall System can be applied over above grade masonry, stucco, block, poured concrete, brick, and exterior grade wood walls for superior weatherproofing, long-term durability, flexibility, and breathability -resulting in excellent adhesion, elongation and toughness. The RenuWall System is environmentally safe and exceeds stringent ASTM D6083 and AIA 9830 performance requirements for elastomeric waterproofing coatings. For more information on our RenuWall Elastomeric Wall Coating System, download our FREE Guide! Whether you have a newly constructed building or looking to restore your current buildings exterior walls, the RenuWall elastomeric wall coating systems provides superior weatherproofing, long-term durability, excellent adhesion, elongation and toughness. These systems deliver high-performance, acrylic, elastomeric coating for above-grade exterior walls. RenuWall provides outstanding resistance to weathering, temperature changes, ultraviolet radiation and mildew. It retains its bright color, long-term flexibility, and breathability for many years. RenuWall moves with the expansion and contraction cycles of a building to keep hairline cracks well sealed. As shrinkage cracks occur in new stucco, RenuWall bridges these openings to maintain a water tight and attractive surface. RenuWall A300 is for industrial/commercial applications only. These suggestions and data are based on information we believe to be reliable. They are offered in good faith, but without guarantee, as conditions and methods of use are beyond our control. The watertight RenuWall System requires minimal maintenance, provides outstanding resistance to weathering, temperature changes, ultra-violet radiation and mildew. It retains its bright color, long-term flexibility, and breathability for many years, resulting in excellent adhesion, elongation and toughness. This elastomeric wall coating system provides a tough film that moves with the expansion and contraction cycles of a building to keep hairline cracks well sealed. This system has the capabilities of preventing water from entering the building as small as one-sixteenth of an inch, keeping the interior of the building dry and waterproof. As shrinkage cracks occur in new stucco, the RenuWall System bridges those openings to maintain a watertight and attractive surface. The elastomeric coatings used have high vapor permeability, allowing moisture vapor to flow out of the wall while still preventing liquid rainwater from infiltrating into the wall assembly. The superior dirt pick-up resistance allows the RenuWall appearance to remain fresh looking new and fresh throughout its lifespan. Installation is environmentally safe, using coatings containing only low odor and ultra low VOC’s. It is easy to apply with minimal disruption to the inside of the building during application. RenuWall Weatherproofing Systems exceed stringent ASTM D6083 and AIA 9830 performance requirements for elastomeric waterproofing coatings. For more information on our RenuWall system using elastomeric coatings or to learn more about our roofing systems – download our Product Brochure – IT’S FREE! Contact a Coating’s Professional for additional information!